ສະມາຄົມເພື່ອຄົນໂອທິສຕິກແມ່ນ ສະມາຄົມບໍ່ຫວັງຜົນກຳໄລ ຂອງບັນດາພໍ່ແມ່ຜູ້ປົກຄອງ ຂອງບຸກຄົນໂອທິສຕິກ. ສະມາຄົມເພື່ອຄົນໂອທິສຕິກໄດ້ຮັບການອະນຸມັດສ້າງຕັ້ງ ຈາກກະຊວງພາຍໃນ ໃນວັນທີ 15.03.2012. The Association for Autism is a non-profit association of parents and guardians of persons with autism registered by Ministry of Home Affairs of Lao PDR on 15.03.2012. Sophie Hartmann, Sol’Asia, Mrs. Margit Hennig, Mrs. Hildegard von Walther, Binnava Vongsay, Elisabeth Thalhammer, Andre Fritzenschaft, Beate de Mur, Siegfried Berg …. Autism in Laos is as widespread as it is in other countries. But it is by far less known and diagnosed as for example in neighboring Thailand. Even doctors do not know much about Autism Spectrum Disorders (ASD), how could one assume that farmers in rural or mountainous areas can do? For most people their kids just "learn to speak a bit later" or " are a bit introverted". So it comes with no surprise that a parents group of children with ASD came into contact with each other with support of a specialised department of a well-known hospital in Thailand. 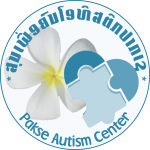 By 2017 AfA knows about 200 children with ASD, 40 of them are enrolled at Vientiane Autism Center, 5 at the newly established Pakse Autism Center.